Is FDI Good for Indian Economy? Foreign direct investment (FDI) is an investment made by a firm or an individual into business interests located in another country. Generally, FDI takes place when an investor establishes foreign business operations or acquires foreign business assets, including establishing ownership or controlling interest in a foreign company. It frequently involves more than just capital investment. It may include provisions of management or technology as well. The key feature of FDI is that it establishes either effective control of, or at least substantial influence over, the decision-making of a foreign business. 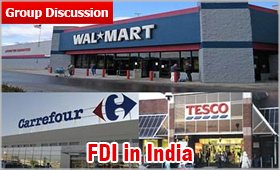 FDI is commonly categorized into horizontal, vertical or conglomerate. A Horizontal FDI is when the investor establishes the same type of business operation in a foreign country. A Vertical FDI is when different but related business activities from the investor’s main business are established or acquired in a foreign country. A Conglomerate FDI is when a company or individual makes a foreign investment in a business that is unrelated to its existing business in the home country. It is mostly in the form of a joint venture. India is a developing nation, trying to make its way up the ladder in the world economy. To achieve its goal, it requires influx of investment, both national and international. Foreign nations often keep an eye on fast-growing economies and are keen to invest in markets where they expect great interests in the future. India allows FDI through two routes- Automatic and Government. Where in automatic route, no prior approval is required, the government route cannot be accessed without approval from Government of India. The Government of India amended FDI policy in 2014 to increase the inflow of FDI. FDI in 25 sectors was increased to up to 100% along with up to 49% in insurance sector. Following this, India became the top destination for FDI overtaking China and USA. The sectors that cannot avail FDI include lottery business, chit funds, casinos, Nidhi companies, real estate, railways and a few others. According to 2018 data, the main investor in India is Singapore, comprising 38.3% of the total FDI followed by Mauritius at 18.2%, Netherlands at 8.8% and USA at 7.1%. Other investors include Japan, UK, Germany, France, UAE and Cyprus. The main sectors availing these investments are chemical sector, accounting for 23.5% of the FDI, followed by services sector at 22.7% and computer software and hardware at 18.6%. Sometimes, when a giant venture is to be started, capital is hard to come by. At such times, FDI comes in handy as a saviour and provides with necessary revenue to meet the initial infrastructural demands required for a project. For example, in May 2018, Walmart acquired a 77 per cent stake in Flipkart for a consideration of USD 16 billion while in February 2018, Ikea announced its plans to invest up to Rs 4,000 crore (USD 612 million) in the state of Maharashtra to set up multi-format stores and experience centres. India is teeming with a wide work force but not enough jobs. When multi national businesses are established, it leads to job creation which the indigenous industries are not able to provide on such a wide scale. According to a report in the Business Today magazine, between 2000 and 2016, British FDI created 371,000 jobs. 10 per cent of all jobs created by FDI. The total number of people employed by British companies in India currently stands at 788,000-representing 5.3 per cent, or one in twenty, of private sector jobs. Though India is developing, it still does not have access to cutting edge technology which comes in handy when working in collaboration with foreign businesses as they tend to bring in latest technology to maintain the quality of the products and services provided by them. It helps to get the products with latest technology. Moreover, it also opens up doorways to research opportunities in the concerned field on the domestic front. FDI in manufacturing sector often helps with the setup as well as better quality of product manufactured. Working shoulder-to-shoulder with people from different cultural backgrounds helps everyone evolve and develop a sense of comfort in any atmosphere if they have to live in it. Multinational businesses offer an opportunity of a multilevel cultural exchange which cannot be seen otherwise. It leads to a certain level of acceptability for the different cultures all over the world. With International brands pouring in to the domestic country, there is scope for better infrastructure, be it in the field of education, health care, information technology, constitutional bodies, construction of rail, road, vehicles among others. FDI also helps to make the Indian infrastructure at par with the facilities available in foreign countries. In June 2018, Idea’s appeal for 100 per cent FDI was approved by Department of Telecommunication (DoT) followed by its Indian merger with Vodafone. This merger made Vodafone Idea the largest telecom operator in India resulting in better overall reach of the company. Better technology may further lead to a reduction in prices of the produced goods which in turn benefits the consumers. Moreover, when a new product is brought into the market, new research and development in the field will definitely lead to better price ranges for consumers in the future. Thus, FDI benefits consumers by reducing prices of goods and services in the long run. With addition of a foreign player in the market, each company strives to do its best, thus increasing the healthy competition in market and in turn benefitting the customer. This benefit may come in form of a variety of products, reduced prices or introduction of a product that was not available in the domestic market before. Investors run after profit. If they see a better opportunity elsewhere, they may shift their interests as well as their investment to the better prospect in a heartbeat without any lieu of the consequences on the economy of the host country unless prior contracts have already been signed. This brings in the uncertainty factor when looking for FDI. This cancellation of contracts may in turn lead to devaluation of Rupee and a financial crisis at hand. FDI is often concentrated either in the richer states of India or in the high skill sectors. This imbalance leads to a probable increase in the economic gap between the rich and the poor. FDI projects are often concentrated to already well-developed states like Delhi, Gujarat, Maharashtra while less developed states like Bihar and Jharkhand are left behind once again thus, increasing the regional economic gap further. Apart from this, in the current scenario, FDI focuses on service sector where skilled labour is required, but the brunt of our problems lie in the majority of unskilled and semi-skilled labour. FDI in sectors like construction, manufacturing and textiles should be further encouraged in order to create more jobs for them. Profit-shifting behaviour among MNCs is induced by the huge tax arbitrage between jurisdictions. While the average effective corporate tax rate in China, Brazil and India ranges from around 17% to 32%, it is much lower in the tax havens of the world like Bermuda, Luxembourg and Netherlands. Corporate tax evasion is an issue that is even faced by the developed nations like US and UK and is thus something that India should take into consideration. Sometimes, proceeds of criminal activities may be used in FDI as a front to cover it up and set up legitimate businesses. The recent case of Air Asia is indicative of how lobbying can be a major factor that can hinder a business in the long run. When foreign companies open their businesses in the domestic market, they often have lower prices for products than the indigenous product prices which harms the local businesses to a certain extent. Sometimes, it may even make it hard to survive for the local businesses among the bounty of cheap products due to well-established infrastructures. FDI in retail also harms the local merchants. There is also a possibility of inflation with prolonged increase in FDI which in turn causes better incomes, more expenditure by consumers. If this expenditure is balanced in form of an increased supply of goods required according to the demand, the inflation caused will be indicative of a progressing economy where as if the incomes increase without any change in availability of products for consumers, the inflation will be detrimental to the economy. For example, if the foreign borrowings were in the form of armaments, which are of no use to the common man, the economy may suffer. When FDI is availed, the host country often works on the foreign timeline and is dependent on the investing country for almost all of its operations from initial capital to laying of infrastructure to the way the business is to be carried forward. This increases dependency on foreign players and is often detrimental to the host country’s economy. For example, looking at the Mumbai-Ahmedabad Bullet Train Project, major funding is to be provided by Japan International Cooperation Agency (JICA). JICA till now had released only Rs 125 crore for the project out of the Rs 80,000 crore to be provided by JICA for the project. The project would cost roughly 1 lakh crore. This delay in funding is one of the causes for the delay of the project. Political parties often try to direct the inflow of FDI for personal benefits which leads to obstacles in the nation’s development and create controversies that if not resolved hamper the rate of economic progression. The most recent case of such a controversy is the Rafale Deal with France’s Dassault Aviations. The opposing party claimed that the ruling party (NDA) has made the deal at triple the price. Although the Supreme Court gave a ruling in favour of NDA, the deal is still a matter of immense controversy. Though FDI is a very good option to move forward but it has its demerits and these should be taken into consideration when designing policies for FDI. Over dependence on foreign investments should not be encouraged. Other alternatives like FII, venture capitalist and Indian innovation must also be promoted to improve the foundations of the domestic economy. Care should be taken to utilize the increase in foreign money inflow. FDI would lead to a more comprehensive integration of India into the worldwide market where India can also make a strong position in global market by exporting their quality products and services.